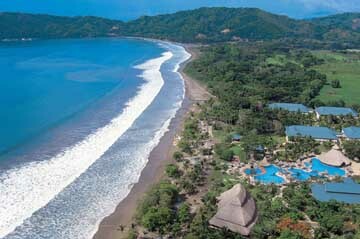 The Barcelo Playa Tambor Resort and Casino is an all year 5-Star Resort located in Bahia Ballena in Nicoya Peninsular. This is a spectacular beach which stretches over 3 miles with natural landscape, exceptional beauty and rich flora and fauna. A perfect destination for those who love surfing, nature trails, horseback riding and luxury accommodations. The Playa Tambor Resort and Casino offers you the "All Inclusive Program," in a style that only Barcelo knows to give you. There are numerous restaurants, night life and entertainment centers - besides being located on one of the most desirable beaches for surfing. 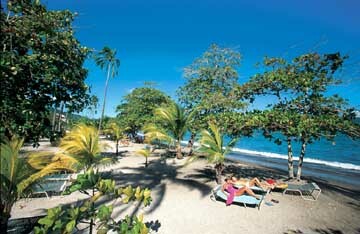 The Playa Tambor Resort and Casino opened in 1992 and was completely refurbished in 1998. There are 402 luxury rooms with mini-bar, satellite TV, maid service, balconies or patios. Amenities available include imported beverages, casino, room service, laundry, phone, fax, internet, money exchange, excursions, medical service, billiard pool table, beauty parlor, massages, gift shop, jewlery boutique, air taxi, aquatic center, deep sea fishing, scuba diving, horseback riding and snorkeling. Overlooking Playa Tambor, on the edge of the Pacific Ocean, Barcelo Tambor enjoys all the charms of a tropical setting of exceptional beauty with 3 mile of beach and a black-cloth of exuberant vegetation where mountain streams flow down to meet the sea. Services in the "All Inclusive Program" include: Ale carte restaurant "El Rancho", buffet restaurant "El Tucan, snack bar "El Palenque", unlimited local beverages, wet bar "El Ronron", lobby bar "El Cocobolo", disco "El Rancho", discotheque "Tamboe" in Barcelo los Delfines Golf and Country Club, concierge service, ecological park, multi-sports courts (Mini-soccer, basketball and handball), 3 lit tennis courts, sand courts (volleyball, mini-soccer), gym and amphitheater. Also available is live music, aerobics, dance classes, stretching, archery, darts, table tennis, shuffleboard, croquet, Jacuzzi water-polo, solarium, windsurfing and private landing strip. There is a casino, gift shop, laundry service, scuba diving lessons, fishing, snorkeling and hairdresser. You would be only two minutes away from a 9-hole golf course, par 32. You can practice any water sports at the beach - kayaks, bogie, velero, etc. Plus there are waterfalls, horse tours, safaris and fishing. Whether you are planing a get-a-way for pleasure and relaxation or business and relaxation - The Playa Tambor Resort is a perfect match with all the up to the moment state-of-the-art facilities at your disposal. Enjoy an enchantment of incomparable beautiful and natural surroundings, visiting Tortuga Island, Curu National Park, Cabo Blanco Nature Reserve, the small colorful village of Montezuma and the waterfalls. Costa Rica awaits you.